Fuschia Dunlop's recipe for smacked cucumbers in garlicky sauce, from "Every Grain of Rice", has changed the way my kids think about cucumbers. My youngest asked me to make this dish for her birthday dinner tonight, and I was more than happy to do it. It's delicious and fun and easy to make. I'm going to show you how. The first step is to assemble the sauce. Or dressing. Call it what you like. 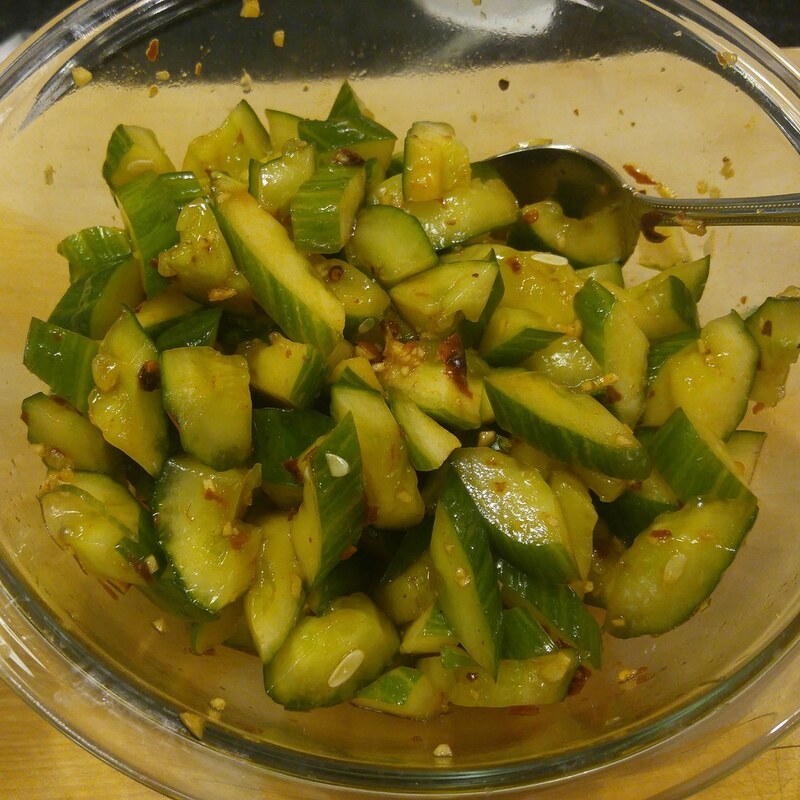 I've been using one large garlic clove and 1/2 tsp of sugar per cucumber. To this I add a teaspoon of crushed chilies fried in oil, soy sauce, and a generous splash of vinegar or some other tangy liquid. My kids are sensitive to Sichuan pepper, so I crank the grinder just a tiny bit. 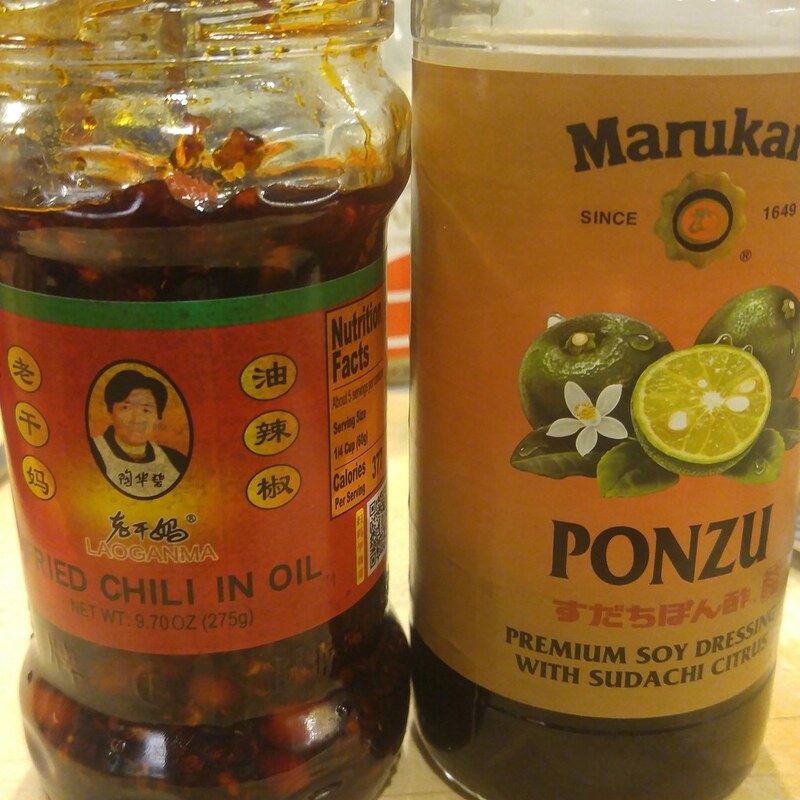 Today I used some bottled Ponzu dressing, but I've also used rice or sherry vinegar (or both). 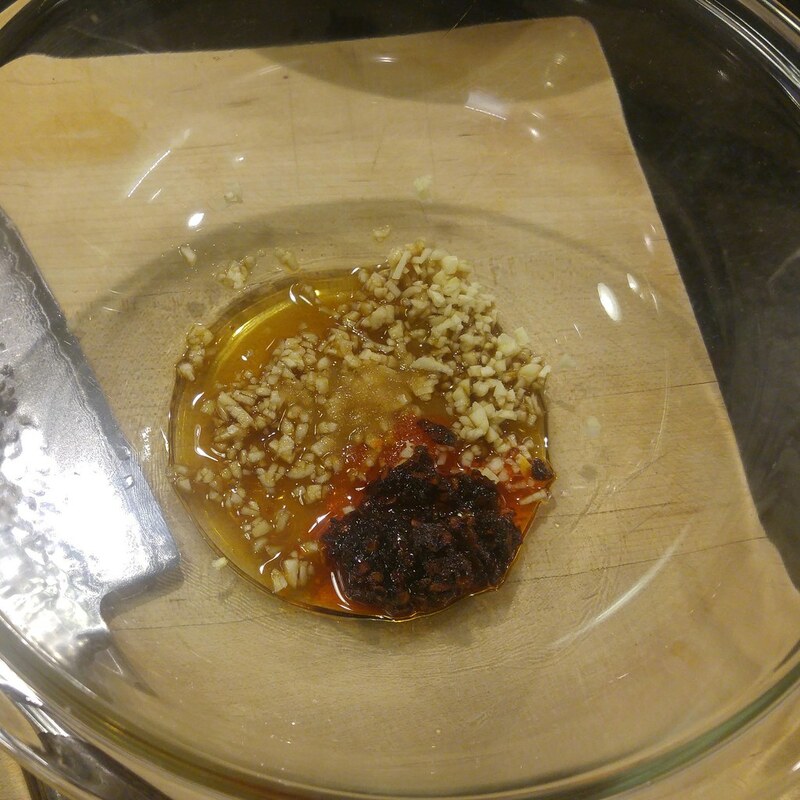 This chili oil has peanuts, which I'm careful to omit because my kids do not love peanuts. Whatever: more peanuts for me! After putting the dressing aside, it is time to smack the cucumbers. Contused cucumis sativus may be a culinary cliché, but this technique is too good to dismiss. It turns ordinary, hard, crunchy cucumber (not a bad thing) into succulent, but not gross and slimy, mildly bitter melon. There's nothing to it: you lay unpeeled thin-skinned cucumbers flat on a cutting board and swat them with the flat of your chef's knife or cleaver just until they crack. 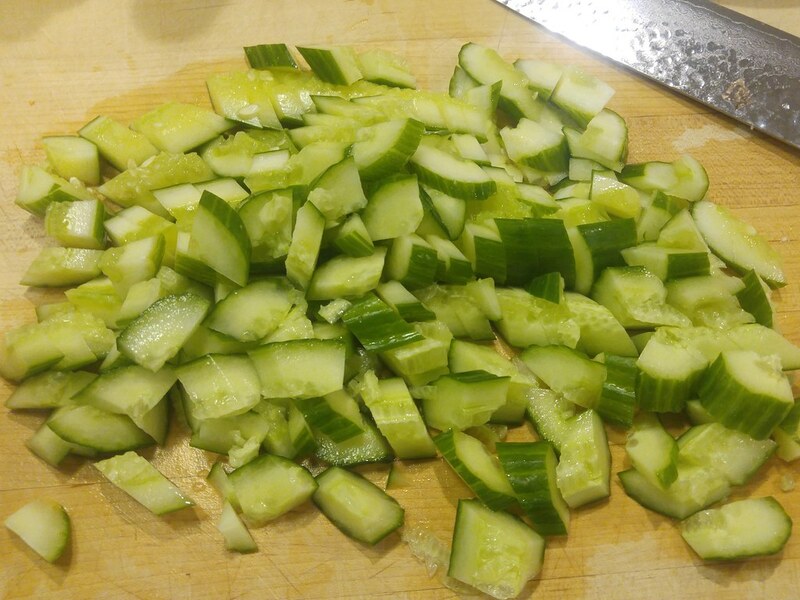 I scraped out the one seedy cucumber, quartered them both lengthwise, and then chopped them diagonally. 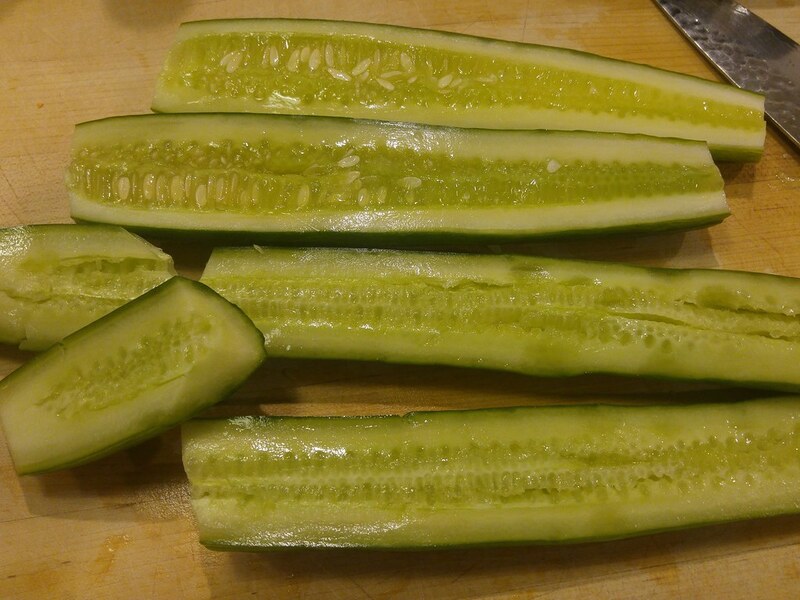 There's no point in trying to slice them into matching 1/8" thick pieces, smacked cucumbers don't give a damn about rules. Toss the chopped cucumber with salt and let it rest for 20 minutes. The goal is to get them to shed water so the sauce doesn't get diluted. These two cukes gave up about 1/3 cup (80 ml) of liquid tonight. 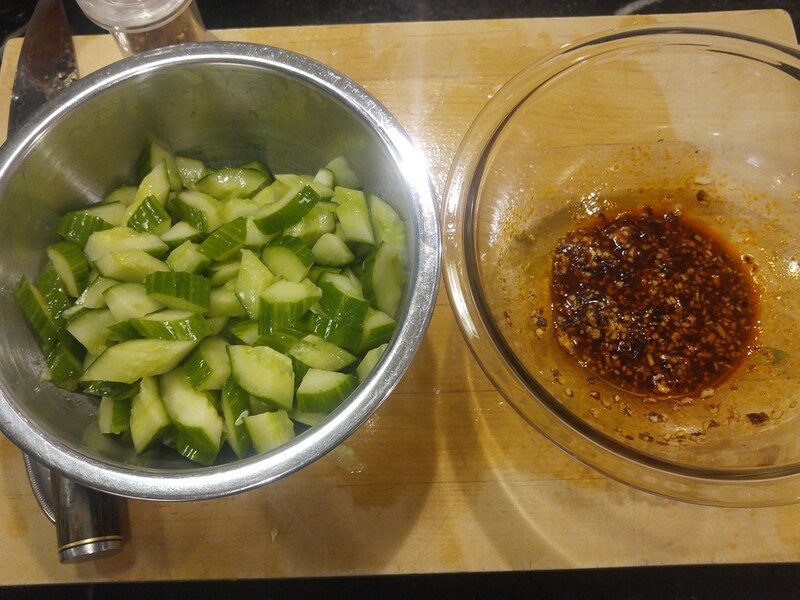 When the time's up and you're ready to eat, drain the cucumbers, transfer to the bowl of dressing, toss well, and serve along with other Sichuan dishes or on top of buckwheat noodles.